Tissue factor (TF) expression in the murine lung after inhalational bleomycin challenge. a) TF mRNA expression in different lung cells 4 (□) and 28 days (▓) after inhalational bleomycin challenge. The n-fold induction of TF-specific mRNA in different lung cells after inhalational bleomycin challenge is given normalised to values from sham-treated control lungs (set at 1; data presented as mean±sd; n = 10). LH: lung homogenate; BAL: bronchoalveolar lavage; AM: alveolar macrophage; mAM: AM obtained by microdissection; ATII: type II alveolar epithelial cells; SMC: smooth muscle cells of medium-size pulmonary vessels; EC: endothelial cells of medium-size pulmonary vessels. ***: p<0.001. b) TF protein expression in the murine lung after inhalational bleomycin challenge. 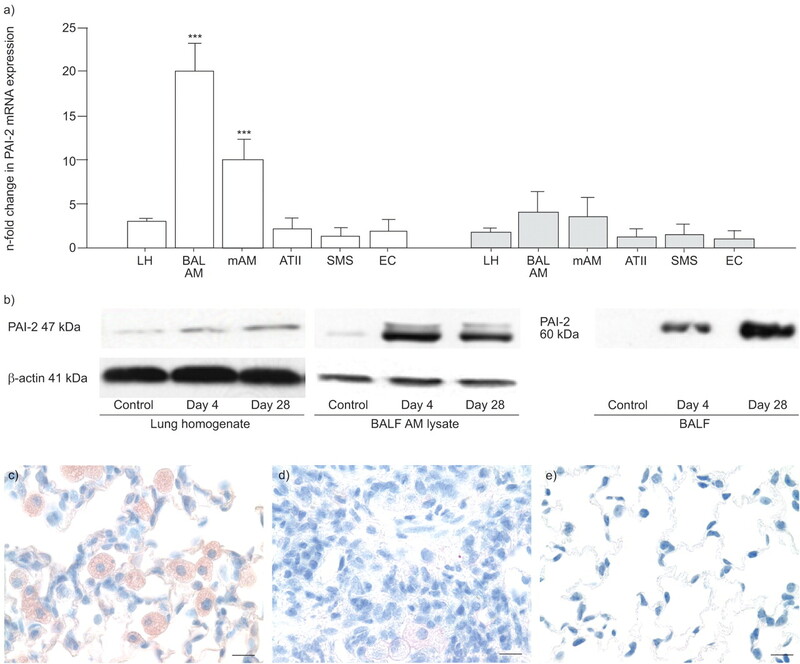 Western blotting was performed on the lung homogenate, the BAL fluid (BALF) AM cell lysate, and the cell-depleted BALF supernatant in sham-treated control lungs 4 and 28 days after bleomycin challenge. Representative blots from five independent experiments are shown. c) Localisation of TF protein in lung tissue. Paraffin-embedded lung sections from sham-treated control mice and from bleomycin-challenged mice (day 28) were stained immunohistochemically with a rabbit anti-TF antibody. Alveolar macrophages (c) as well as hyperplastic ATII (c and d) stained positive for TF in the lungs of bleomycin-treated mice, as compared with sham-treated control lungs, in which a slight positive signal for TF was detected in alveolar macrophages only (e). Representative microscopic fields of view are shown. Five bleomycin-treated and four sham-treated mice were examined. Ten fields were analysed per section for five sections of each mouse. Controls were performed by substituting the primary antibody for a nonspecific antibody (not shown). Scale bars = 5 μm. Plasminogen activator inhibitor (PAI)-1 expression in the murine lung after inhalational bleomycin challenge. a) PAI-1 mRNA expression in different lung cells 4 (□) and 28 days (▓) after inhalational bleomycin challenge. The n-fold induction of PAI-1-specific mRNA in different lung cells after inhalational bleomycin challenge is shown normalised to values from sham-treated control lungs (set at 1; mean±sd; n = 10). LH: lung homogenate; BAL: bronchoalveolar lavage; AM: alveolar macrophage; mAM: AM obtained by microdissection; ATII: type II alveolar epithelial cells; SMC: smooth muscle cells of medium-size pulmonary vessels; EC: endothelial cells of medium-size pulmonary vessels. #: p = 0.02; ¶: p = 0.009; ***: p<0.001. b) PAI-1 protein expression in the murine lung after inhalational bleomycin challenge. 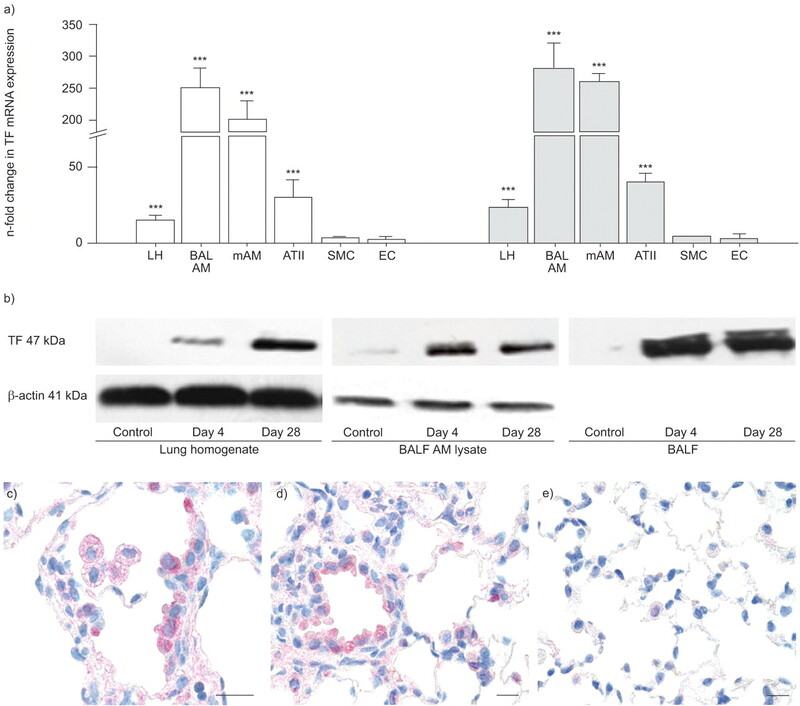 Western blotting was performed on the lung homogenate, the BAL fluid (BALF) AM cell lysate, and the cell-depleted BALF supernatant in sham-treated control lungs, 4 and 28 days after bleomycin challenge. Representative blots from five independent experiments are shown. c) Localisation of PAI-1 protein in lung tissue. Paraffin-embedded lung sections from sham-treated control mice and from bleomycin-challenged mice (day 28) were stained immunohistochemically with a rabbit anti-PAI-1 antibody. Alveolar macrophages (c) and, to a lesser extent, hyperplastic alveolar type II cells (d) stained positive for PAI-1 in the lungs of bleomycin-treated mice. In contrast, in sham-treated control lungs only AMs stained slightly positive (e). Representative microscopic fields of view are shown. Five bleomycin-treated and four sham-treated mice were examined. Ten fields were analysed per section for five sections of each mouse. Controls were performed by substituting the primary antibody for a nonspecific antibody (not shown). Scale bars = 5 μm. Plasminogen activator inhibitor (PAI)-2 expression in the murine lung after inhalational bleomycin challenge. a) PAI-2 mRNA expression in different lung cells 4 (□) and 28 days (▓) after inhalational bleomycin challenge. Depicted is the n-fold induction of PAI-2-specific mRNA in different lung cells after inhalational bleomycin challenge normalised to sham-treated control lungs (set at 1; mean±sd; n = 10). LH: lung homogenate; BAL: bronchoalveolar lavage; AM: alveolar macrophage; mAM: AM obtained by microdissection; ATII: type II alveolar epithelial cells; SMC: smooth muscle cells of medium-size pulmonary vessels; EC: endothelial cells of medium-size pulmonary vessels. ***: p<0.001. b) PAI-2 protein expression in the murine lung after inhalational bleomycin challenge. 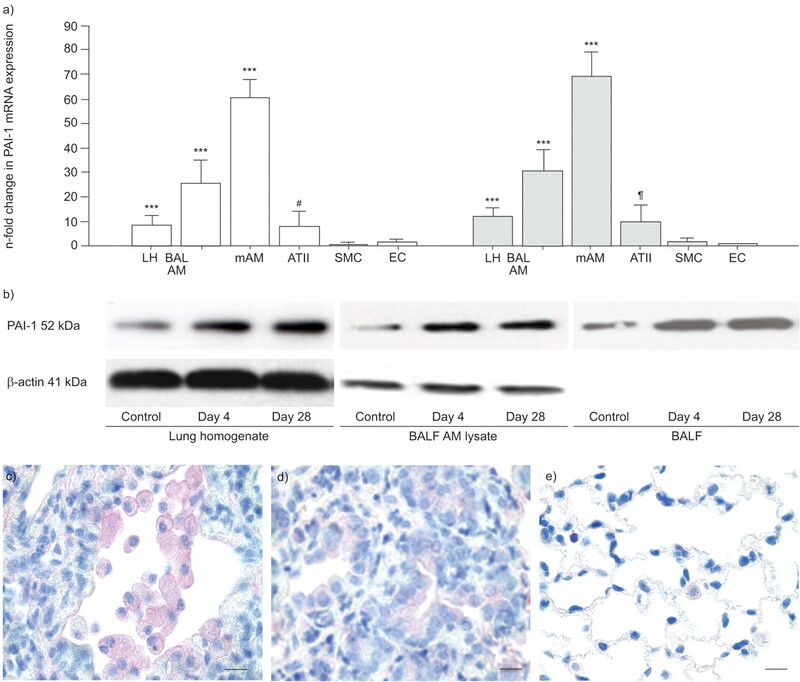 Western blotting was performed on the lung homogenate, the BAL fluid (BALF) AM cell lysate, and the cell-depleted BALF supernatant in sham-treated control lungs, 4 and 28 days after bleomycin challenge. Representative blots out of five independent experiments are shown. c) Localisation of PAI-2 protein in lung tissue. Paraffin-embedded lung sections from sham-treated control mice and from bleomycin-challenged mice were stained immunohistochemically with a goat anti-PAI-2 antibody. Strong PAI-2 immunoreactivity was evident in AMs 4 days after bleomycin administration (c), but not on day 28 after bleomycin administration (d) or in sham-treated control lungs (e). Representative microscopic fields of view are shown. Five bleomycin-treated and four sham-treated mice were examined. Ten fields were analysed per section for five sections of each mouse. Controls were performed by substituting the primary antibody by a nonspecific antibody (not shown). Scale bars = 5 μm. Urokinase-type plasminogen activators (uPA) activity in the murine lung after inhalational bleomycin challenge. 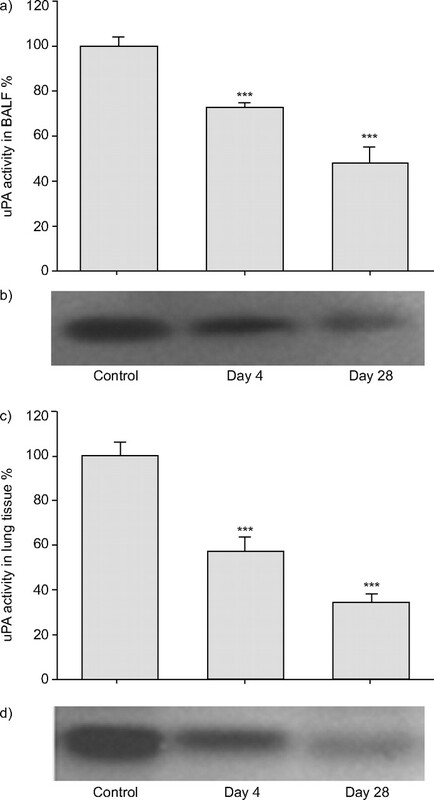 uPA activity in the a) bronchoalveolar lavage fluid (BALF) and c) lung homogenate of mice 4 and 28 days after inhalational bleomycin challenge is given as a percentage of that in sham-treated mice (control mice: 100% activity), as assessed by casein zymography. n = 10 for each group. b) Representative zymogram (one of 10) from BALF. d) Representative zymogram (one of 10) from lung homogenate. ***: p<0.001 for bleomycin-treated versus sham-treated mice. Data are shown as mean±sd from 10 mice for each group. BALF protein concentration, BALF cell differential and pulmonary compliance for sham-treated mice (control) and for bleomycin-challenged mice at days 4 and 28 after inhalational administration of 15 mg·kg−1 bleomycin are given. AM: alveolar macrophages; PMN: polymorphonuclear neutrophils. Data are presented as mean±sd. The n-fold induction of uPA-, tPA- or TFPI-specific mRNA in different lung cells after inhalational bleomycin treatment is given normalised to vehicle-challenged control lungs (set at 1; n = 10). LH: lung homogenate; BALF: bronchoalveolar lavage fluid; AM: alveolar macrophages; mAM: AM obtained by microdissection; SMC: smooth muscle cells of medium-size pulmonary vessels; ATII: type II alveolar epithelial cells; EC: endothelial cells of medium-size pulmonary vessels. #: p = 0.03; ¶: p = 0.02; +: p = 0.002.